A Girl’s Guide to Fitting in Fitness: The Book. OUR BOOK! Sorry if the headline is a little excited, but we are so excited you guys! 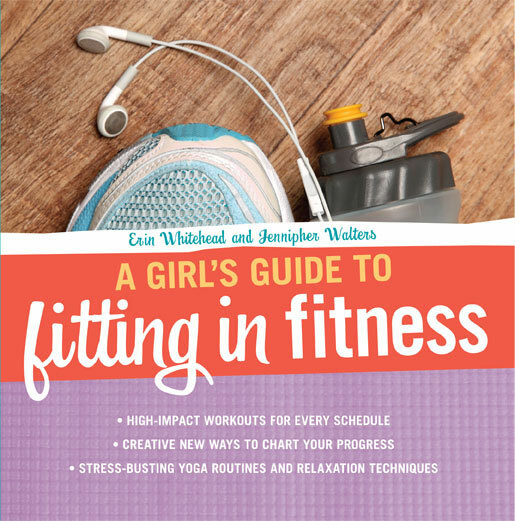 A Girl’s Guide to Fitting in Fitness—our very own book—is available for purchase this week! Zest Books, a publisher of teen nonfiction, came knocking on our FBG doors what seems like forever ago. After careful consideration, by which I mean we jumped up and down shouting “YES! WE’D LOVE TO SPREAD OUR MESSAGE TO TEENS!”, Jenn and I jumped right into the project. We thought it was such a great opportunity to spread a healthy living message to tweens and teens, and to let busy girls know how they can manage to eat right, exercise doing activities they love and gain confidence. (And don’t tell, but the book has darn good sane advice for women of any age!) Girls get so many mixed messages when it comes to eating right and working out and body image that we wanted to tackle those issues before girls get the wrong idea that restricting calories and overexercising is a good way to live. So in this book, we tackle those issues, in a good way! Friendly tackling. A Girl’s Guide to Fitting in Fitness talks the reader through the basics of a fitness plan and why it’s so important to be active. It also includes basics on eating well—including how to navigate the school cafeteria and vending machine—and how the busy girl can fit activity in throughout her day and on weekends. (Spoiler: Our ideas are really fun!) We’ve also got a chapter on taking your fitness up a notch once you’ve got the basics down pat and are ready to kick it up, along with stress-busting techniques that can calm any frazzled teen. We bust myths, include tips from real teens and generally make fitness really fun. But seriously, don’t take our word for it. We’ve got a review here for you to read (We don’t even know the guy who wrote it! Unbiased! ), and we’re giving away five copies to readers! So if you’re a mom of a teen girl, know a teen girl loosely, or just want to read it yourself, comment below for a chance to win. We’ll notify winners by email in about a week.